Mobile Press Truck at Pete’s Tire Barns. We know that your forklift is critical to your business and when it is down your business is down. That is why we offer mobile press truck service for all your forklift tires needs. We come right to your site and mount your new forklift tires quickly and efficiently with the least amount of downtime possible. We have tires, tools and trained technicians to handle all of your industrial tire needs. No matter if your forklift has pneumatic tires, solid tires or press on tires, Pete’s Tire Barns can handle it. We have 19 locations to service all of your forklift truck tire needs. 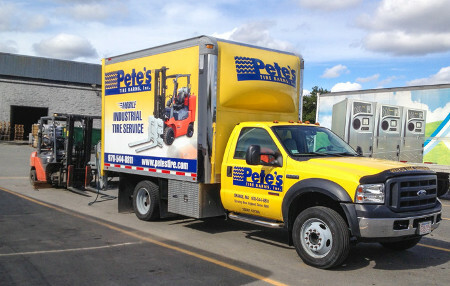 Call your local Pete’s Tire Barns today and schedule a visit from one of our forklift tire experts.